Unique hand carved Santas and wooden old world Santa Claus figures. Offering hand carved wooden Christmas tree ornaments and Christmas decorations. In our Hand Carved Santas Gallery. We offer a wide variety hand carved Santas for sale. 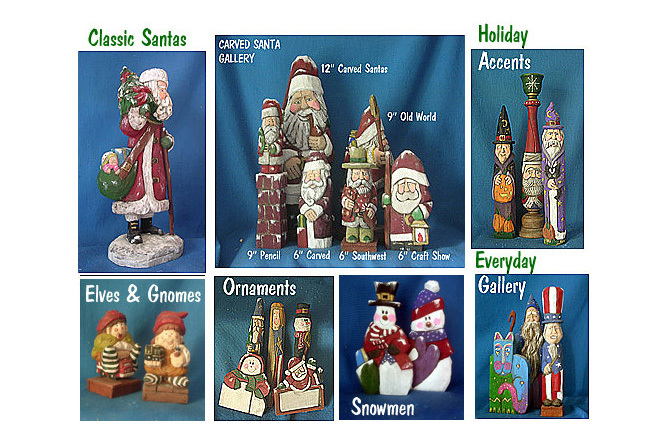 Heirloom Old World Santa Claus carvings have a unique style and make great Christmas gifts. You can give your Christmas tree a unique look with a wonderful assortment wood handmade Christmas tree ornaments. Our Limited edition collectible reproductions make the perfect Holiday or Christmas gift idea for anyone who loves collectible art. Take a look at our Limited Editions and you will see why we feel they are special.